Of course, the car has yet to be built, let alone break that record. But the effort is quite serious, these people are not amateur, and they have serious sponsors. It will use one EJ200 jet like the one used by the Eurofighter—hopefully a real one, unlike the one I got into at Dubai two years ago—alonside a one 18" hybrid rocket, and a V12 piston engines. 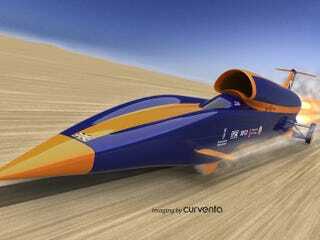 The 6500-kilogram Bloodhound—which is being built in Bristol—will have a 47,000lbs trust, with a top speed of 1050mph.